On the small North Sea island Helgoland (54°11′ N, 07°55′ E) we studied the stopover ecology of two subspecies of northern wheatear, Oenanthe oenanthe, during spring migration. Birds heading for Scandinavia (O. o. oenanthe) face only short flights across an ecological barrier (50–500 km) whereas those originating from Greenland and Iceland (O. o. leucorhoa) have to cover between 1,000 and 2,500 km in the impending flight. Colour-ringed individuals showed that 90% of Scandinavian birds left on the day of ringing while 40% (males) and 30% (females) of Greenland/Icelandic birds stayed at least 1 night. The birds who remained were thus mostly O. o. leucorhoa. They often established desirable feeding territories on the beach and had a high rate of body mass increase (1.7 g/day). However, subspecies did not differ in habitat choice and in foraging effort, but O. o. leucorhoa had a higher success rate in pecking. Departure decisions were analysed by comparing (a) conditions on the day of ringing between departing and staying birds and (b) for birds staying between the day of departure and the preceding day. The factors that were probably important in the decision to depart differed between subspecies. In O. o. leucorhoa, few birds departed with bad or deteriorating weather conditions (tailwind component, cloud cover), whereas departures of O. o. oenanthe seemed to be little affected by those factors. A few O. o. oenanthe stayed early in the spring migration season and/or had low fat reserves. Interference during foraging seemed to play a role because both subspecies tended to leave when the densities of northern wheatears were high. 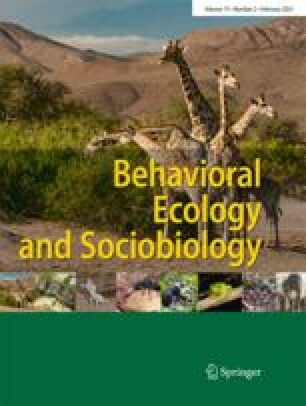 Other factors related to refuelling conditions (food supply, foraging effort, predation risk) failed to show differences between staying and departing individuals. In summary, almost all Scandinavian birds departed quickly and irrespective of refuelling and weather conditions, whereas many (but not all) Greenland/Icelandic birds seemed to prepare for a long-distance flight and carefully adjusted departure to weather conditions. The observed differences in stopover behaviour and departure decisions in the two subspecies of northern wheatear indicate that the distance to the next stopover site or to the goal area has to be considered when applying optimal migration models.